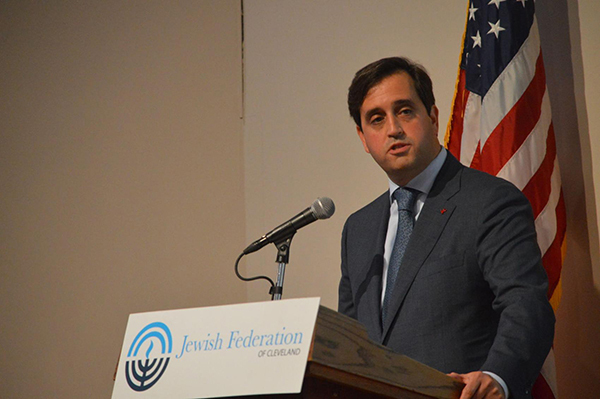 The Federation’s annual fundraising campaign serves Jewish Cleveland and the global community. Last year, the campaign raised $32,238,328 from more than 9,700 donors, in addition to a $500,000 match. This year, Jeff Wild, the campaign chair, said the campaign is ahead of last year’s pace with a donor count of 6,000 and on pace of the amount raised with more than $26 million. The goal is to have 10,000 donors by the close. The closing event will feature music and food from Cleveland, Israel and Russia. Attendees will also hear reflections on this year’s theme, “The Impact of Together,” from outgoing Federation President Stephen H. Hoffman. In the aftermath of the shooting that killed 11 people at Tree of Life Congregation in Pittsburgh, which took place during the campaign, Wild said there was a re-evaluation of the funds allocated to securing the synagogues, day schools, agencies and the Jewish community. The Federation spends $1.2 million on security and it’s expected to increase, thus the campaign needs to raise more money than originally planned. The campaign also changed its donation approach by using the Federation’s online platforms, which Wild credits for the increase in new donors. Also, Natan D. Milgrom will receive the 2018 Amb. Milton A. and Roslyn Z. Wolf Young Campaigner of the Year Award. The award recognizes leadership, dedication and hard work by a young leader on behalf of the Campaign for Jewish Needs.